What it's like to be an introvert... 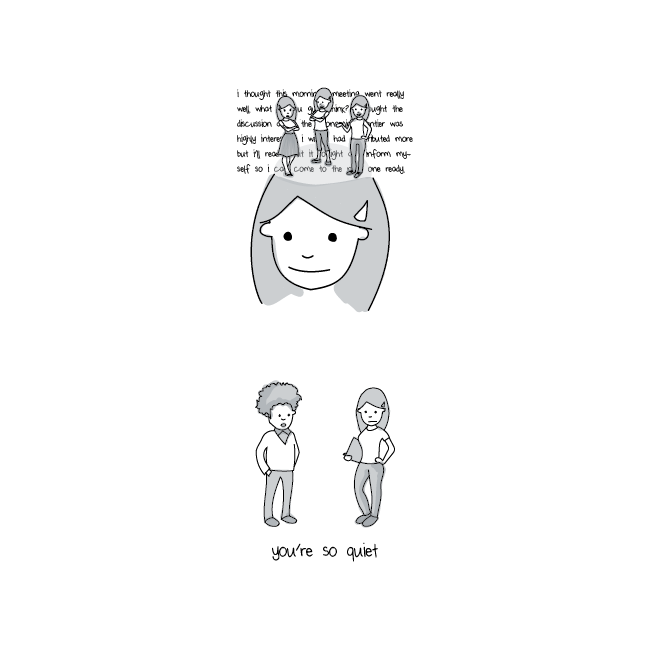 Here's another site exploring what it's like to be an introvert, this time with some nifty drawings (like the one at right). Ever since I discovered what an introvert really is, and that I was one, I've been fascinated by the impacts of introversion vs. extroversion. I was in a profession (engineering) where introverts have a distinct intellectual advantage, and yet the management of engineering organizations is dominated by extroverts – a situation that's bound to cause friction (and it does!). Perhaps the most obvious example of this is the movement toward “open offices” (cubicles) for engineering teams – something only an extrovert could love, and that's guaranteed to lower an introvert's productivity. Extroverts were positive that open offices would improve the productivity of engineering teams, but ... not so much (as engineering teams are, generally, dominated by introverts). What's most interesting to me about this is how the extrovert proponents of open offices just don't get it. It is – I think perhaps literally – beyond their ken.